Did you see any of the news coverage about the completion of Birmingham New Street station’s £750m rebuild last month? Finally, after years of work, the rebuilt station opened with a huge new concourse, topped by a dramatic atrium, a branch of John Lewis, and a new shopping centre. The outside is clad in mirror-finish stainless steel panels, and three huge “media eyes” stare Sauron-like into the surrounding streets, rendering passers-by Hobbit-like in scale. It’s great, and I only wish the work had been done while I was at university in Birmingham, and a regular user of the station, rather than years later. New Street is Birmingham’s biggest railway station, and the busiest British station outside London. It serves the London-Scotland West Coast Main Line and a host of cross-country routes. Now the city finally has a New Street station it can be proud of, redressing an injury inflicted when the station was last rebuilt in the 1960s as a claustrophobic concrete catastrophe. While there was much media attention on New Street’s rebuild, it largely escaped notice that one part of the 1960s station hadn’t been touched at all. 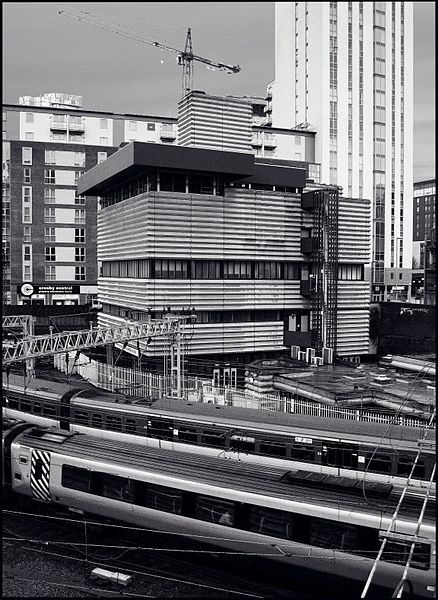 New Street’s signal box was left well alone, and is now the most significant survivor of the 1960s rebuild of the station. That’s partly because it is not a public area, partly because it faces redundancy in the near future, and partly because (unlike the passenger elements of the station) it’s on England’s list of statutorily protected buildings. It was built in 1964 in the Brutalist style that was popular at the time. It’s big, blocky and uncompromising. Unusually tall for a signal box, it runs to five storeys, a veritable skyscraper amongst signal boxes. With the railway tracks buried under the local roads, it is only four storeys as seen from street level. Even that’s enough for some people, and it has often been referred to as an eyesore. Its tall, narrow design (the ground floor spreads further, as you can see in image 6 of this gallery at Network Rail’s Virtual Archive) was partly a response to the awkward and constricted site into which it had to be squeezed, partly to allow signallers a view into the station, and partly to allow access from the street at first floor level. It also had to house telecommunications as well as signalling equipment. Its architects were Bicknell and Hamilton, which worked with R L Moorcraft, the regional architect for the London Midland Region of British Railways, who designed the rest of New Street station. At its core, it’s a conventional steel-framed building. On the outside, the majority of the building is faced with corrugated concrete panels which feature a triangular profile. Narrow runs of steel framed windows break up the concrete panelling and are the only clue that this is an inhabited structure, not just a building for plant. 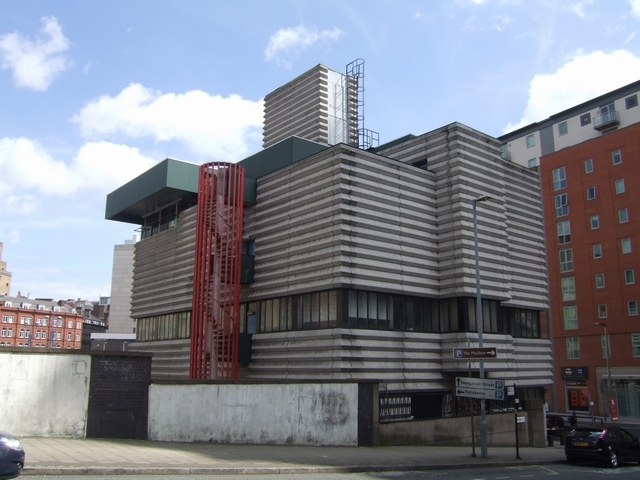 If windows are the eyes of a building, and eyes are the windows to the soul, New Street signal box plays its cards close to its chest, an aloof building inaccessible to the public which positively averts public interest in what might be going on inside. On top a massive roof projects outwards on the station side, ensuring that the signal box’s windows are shaded and signallers are protected against the dazzle of the sun. It also provides some asymmetric drama to the top of the building, which appropriately enough seems to be leaning forward towards the tracks as though taking a minute interest in the comings and goings of the trains at its base. A fire escape to the side gives further vertical emphasis to the building, and contained within a skeletal cylinder structure sports about the only curves in the design. 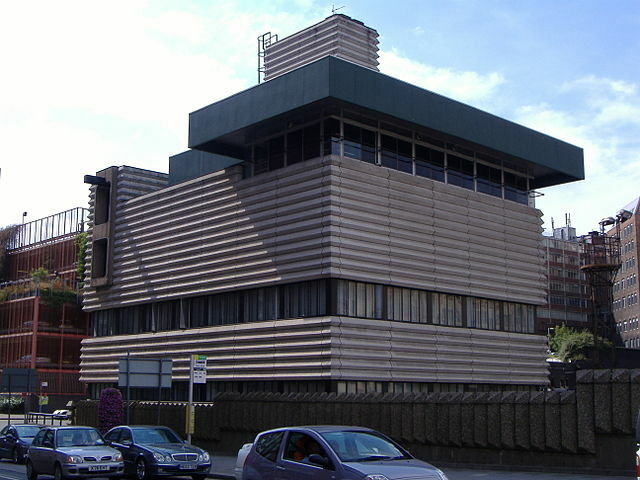 Compared either to the picturesque pitched-roof signal boxes which most people would recognise (see a BBC News gallery of such buildings here), or the Southern Region’s ship-like Streamline Moderne models, New Street Signal Box is an uncompromising riposte that takes little account of traditional aesthetics. Like a lot of Birmingham’s 1960s architecture, beyond New Street station and including buildings like the recently demolished Central Library, New Street signal box doesn’t put a lot of effort into trying to make you love it. It is what it is, and dares you to accept it. If you can’t then you might as well be over-awed by it. Though divisive, it’s a true “one-off” amongst British signal boxes, as Historic England puts it. It is currently looking fairly clean and tidy after a 2001 deep clean by the then-national railway infrastructure owner Railtrack. Railtrack had wanted to sand-blast it, but couldn’t because the building had been listed in 1995, and such a cleaning regime might have damaged it. So it settled on a high-pressure wash with washing-up liquid, a project which needless to say led to Railtrack being criticised for profligacy in spending money on something other than operations or safety (see a news story about the clean-up here). 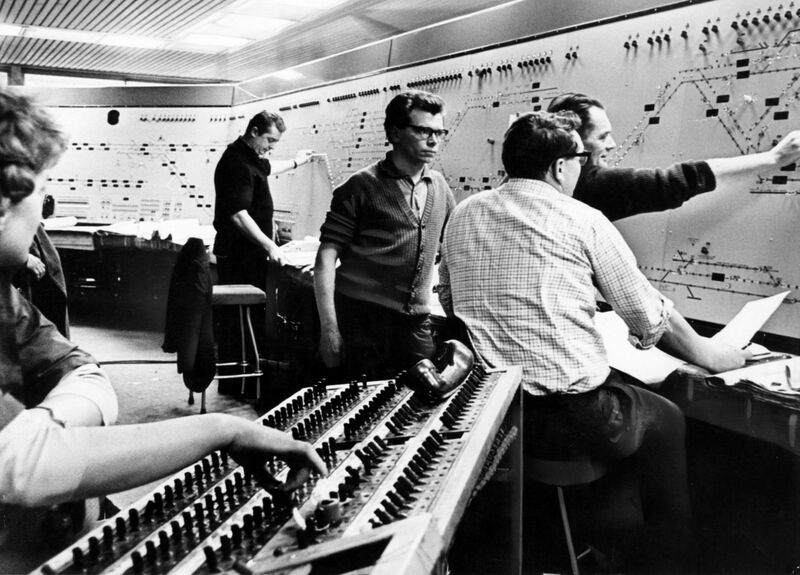 When the signal box was built, it was full of the latest, cutting-edge technology. That technology, based on electromechanical relay switches, is still signalling New Street station and the lines leading into it. On a rare tour around the inside, local newspaper the Birmingham Post found the algorithmic electronic relays called “Wespacs” ticking away as they opened and closed. You now need to be an expert in antiquated technologies to keep the signal box in working order, its technology today looking little more sophisticated than the bombes of wartime Bletchley Park. (See the Birmingham Post’s report here). Inside the main operating room, it’s all false ceiling panels and fluorescent lighting, though a 1966 photo in the same Birmingham Post article suggests the ceiling originally had much more stylish wooden slatting (see that photo here). With obsolete technology controlling busy stations, no wonder Railtrack’s successor Network Rail has embarked on a massive scheme to replace the country’s hundreds of signal boxes with just 12 Rail Operating Centres (see page 15 of this Network Rail brochure). New Street signal box’s technology isn’t even the most antiquated to be found on the rail network. Once all the ROCs are commissioned, Network Rail will begin the move towards nationwide installation of the European Train Control System and the eventual removal of lineside signals altogether, though that’s probably decades away. Before too long, New Street signal box’s functions will be transferred to the West Midlands Signalling Control Centre at Saltley (as detailed here). After that, it will be redundant unless a clever new use can be found for it, though its size and shape makes it difficult to think what that might be. Listed at Grade II by Historic England for its “exceptional architectural quality” and “strongly sculptural form” it will remain standing though, unlike so many of the other signal boxes around the country, which are disappearing as I write. It will remain a reminder of the 1960s New Street station, one that the largest atrium and shiniest of exteriors cannot quite obliterate. It’s hardly the ugliest thing in Birmingham. Sadly, a lot of Brutalist architecture is modified over the years and loses the cohearance of it’s initial design. This isn’t the case here, presumably why it’s been listed. Quite agree. I find myself coming round to the idea of some Brutalism and surprising myself! Nikolaus Pevsner, no less, compared it to a giant liquorice allsort! I can sort of see what he meant. This is a rare example of where brutalism actually works, a real form follows function. It has a reassuring presence, like a castle watching over the ceaseless train movements. A modern version of the castle keep at Newcastle? Decommissioning is still, I believe, scheduled for 2017 and despite the listing that must indicate an uncertain future, especially as, like a lot of 1960s buildings, it is possible that any future use/conversion will have to start by dealing with asbestos. As for the original wooden slatted ceiling, I notice that a lot of 1960s buildings have rather fine wooden detailing that seems to be the first victim when somebody decides to ‘update’, taking away what is often the best.